This particular myth seems to have arisen from a marketing campaign designed to convince consumers that the only way to get meaningful benefit from the color management systems that are becoming more common is to use an affordable spectrophotometer, such as the i1Pro. The i1Pro is more accurate than X-Rite's standard colorimeter, the Display 2. However, it is more accurate for both white and color. Furthermore, X-Rite's premium colorimeter, the Chroma 5 (replaced by the Display 3), offers accuracy similar to the i1Pro and this is again for both white and color. Plasma: The errors for white and color are, on average, identical. Sony LCD: Color is slightly less accurate, 0.001 in the x axis and 0.004 in the y axis. 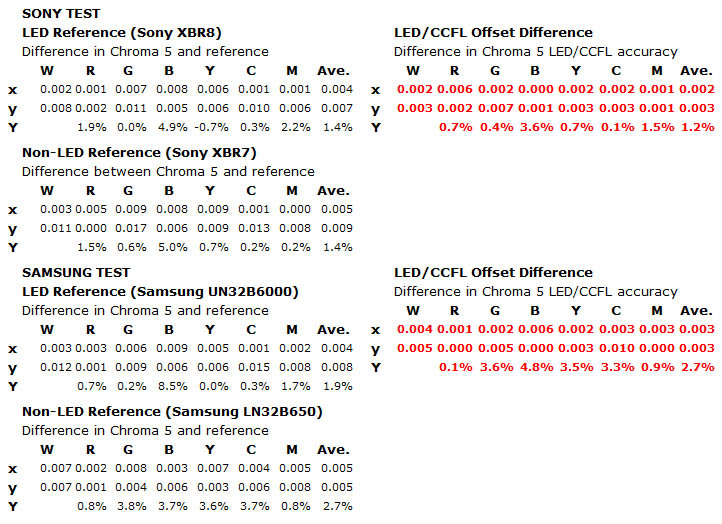 Samsung LED LCD: Again, color is only slightly less accurate in the x axis by 0.003. In the y axis they are identical. Front Projector: The errors for color and white are virtually identical. This data explodes the myth that a tristimulus colorimeter does well with white but poorly with color. This data shows that there is either no difference at all or in some cases only a very small difference. Again, this is for the average color reading. Any individual reading may, and often is, less accurate than white. But the average results are about the same. Myth #5: Tristimulus colorimeters, such as the Chroma 5 or Display 3, require special calibration tables to work well with LED-backlit LCD displays. Fact: Not true. The claim that colorimeters, such as the Chroma 5 or Display 3, require special calibration to work with LED displays is an empirical assertion that stands or falls on what the evidence shows.